Inverse functions can be found algebraically by interchanging x and y in the function definition and then making y the subject of the equation. They can also be found graphically by reflecting the graph of the function in the line y = x. 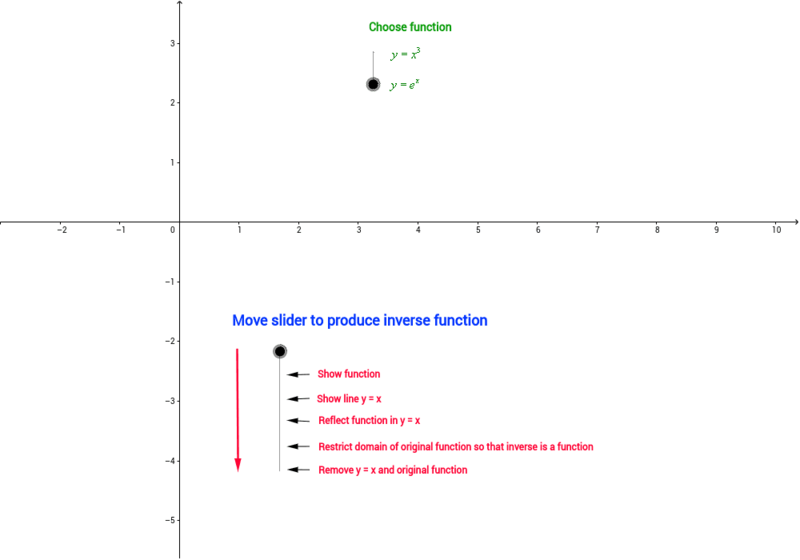 (Some adjustment may be needed to the domain of the original function to ensure that the inverse function is in fact a function.) To produce the inverse of y = x^3 and y = e^x, follow the instructions below the construction. You will benefit most from this exercise if you attempt to predict what will be produced by each movement of the slider. 1)Choose the function 2) Draw the function 3) Draw the line y = x 4) Reflect the function in the line 5) Choose a region of the domain for the function which contains the origin, the curve is monotonic and it covers the full range (this step is not neeeded in this worksheet) Draw up a table which shows the domain and range for the function and its inverse.